It’s taken me a long time to complete this review. Having read this book a couple of months ago I have since been reflecting on it a lot and wondering about my feelings about it. It was one of those books that, before reading, I knew that I ‘really wanted to like it.’ And like it I did. But it wasn’t a simple, straightforward affection. Much like I know that I would struggle on the famous hairpins of the mountain itself, I struggled to some degree with this book about Alpe d’Huez too. But I couldn’t work out why.. I have enjoyed Peter Cossins’ writing before – his The Monuments is excellent – and the material for his latest offering is tantalising to say the least: A portrait and a history of cycling’s most famous climb – the scene for some of the most memorable images, battles and wins in the most famous bike race of them all. So why the struggle? First though, why the mountain? Why does this particular climb warrant a book all to itself? Here the answer is obvious. 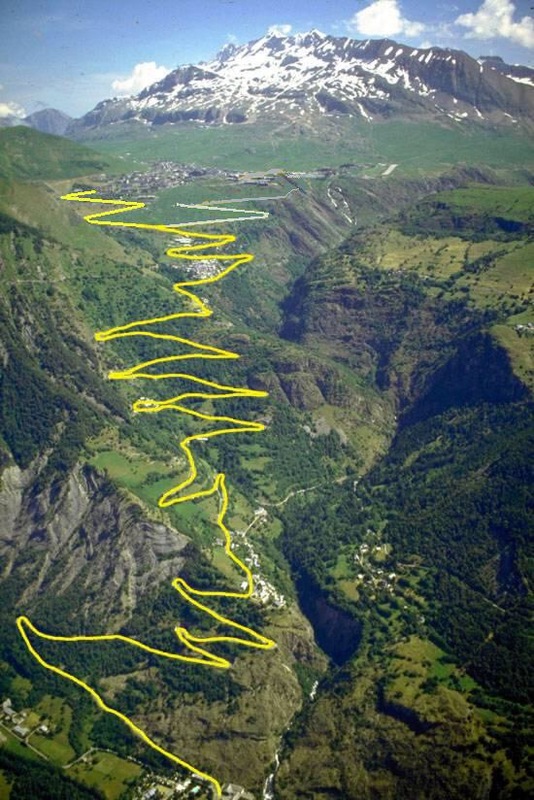 Despite only featuring in the Tour 28 times in 100 editions – and only regularly after the second visit in 1976 – Alpe d’Huez is a climb like no no other. Despite the inauspicious start, cycling’s “Hollywood” climb now garners attention, interest and, most importantly, visitors like no other. These days the party on the mountain almost transcends the race itself with the passage of the cyclists recast as the culmination of a three day bender that many attendees would not go anywhere else for. Famous DJ’s are booked to “play” Alpe d’Huez’s Dutch Corner. That alone is a measure of its uniqueness and its greatness. Telling the tale of a single mountain’s contribution to cycling would always need some clever structuring in order to avoid becoming a boring chronology of achievements, and again Cossins deftly avoids the obvious by framing the book around a single day on the Alp. He weaves the story of one particularly significant ascent – the 1976 duel between Joop Zoetemelk and Lucien Van Impe – throughout the books 290 pages allowing a detailed narrative strand to form as the two protagonists haul their way up the 21 bends to the little ski station, which has become more famous as a summer cycling mecca than as a winter sports location, to contest both the day and the wider Tour. Cossins has spoken – in the excellent VeloCast Reading Room podcast – about how he wanted to go ‘beyond the cycling’ and look at other elements that contribute to a full portrait of the mountains. He delves deep into the very rock to explain the geology of the Alp whilst the historical strands, charting how the Alpe manoeuvred its way up the slippery slope to stardom, are also well done. The relationship between the Tour, the ski resort and the chance occurrences that captured the Dutch people’s affection for this particular set of gradients is also explored; offering real insight about something we now take for granted. So where is the rub? Why this initial ambivalence? For me it came down to structure. The book has chapters – though not titled ones – across which the italicised tale of Van Impe and Zoetmelk’s 1976 battle royale is clearly defined, but I occasionally got lost in the other writing. By using the geography of the ascent as a trigger for various Tour or wider history tales, the timeline jumps back and forth as vigorously as the early switchbacks, and naturally the individual stories race up and down the climb many times over within the pages. Having subsequently listened to Cossins explain his thinking in the Velocast podcast, this approach made far more sense than when I approached it cold. On first reading, it had left me disoriented and as a result somewhat disappointed but had I been armed with the expanded explanation beforehand I know that I would have got more from this otherwise excellent book. Cossins also refers to another earlier book about the Alp – Jean Paul Vespini’s The Tour Is Won On The Alpe – which, as a more pure recount of the Tour’s visits to its venerated slopes, might be a good primer onto which this wider-ranging exploration can offer a greater set of stories. The other interpretation, of course, is that the “Hollywood” mountain is always destined to fail to live up to its hyped-up billing. We simply expect too much of Huez. Many riders and experienced Tour watchers dislike the Alp for similar reasons. It’s lack of distant history and the often distasteful atmosphere on some sections of the mountain in modern times divide opinion like no other. People question the special status that it is afforded; why does the Alp get back to back stages, double ascents and, this year, the honour of being the final climb on the penultimate day of the race. There are higher mountains, harder mountains, more beautiful mountains. But there are none more famous. None with such ‘star quality’. And for that reason the Alp will continue to write its own history larger than any other. I hope that I haven’t put anyone off buying this book. That is not my intention. It adds great depth to our understanding of this Tour de France ‘monument’. Maybe just check out either of those two supporting sources first. You’ll get far more out of it that way. This entry was posted in Le Tour de France, Product Reviews, Uncategorized and tagged alpe, alpe d'huez, Cycling, dutch corner, huez, Pro cycling, TDF, Tour de France, van impe, zoetemelk. Bookmark the permalink. Sounds an interesting read. Having crawled my way through the europop blast on Dutch Corner on the morning of the 100th Tour coming through I can vouch for the climb as a unique experience for me at least.